For the past few years, I've been spending quite a bit of time adding Alaska landform features and backcountry details to Open Street Map (OSM). This post will the first of several that describe this work. As many of you know, I'm heavily involved with, many would (rightly) say addicted to, OSM mapping. I do ground surveys, make mapping expeditions by motorcycle and car, and follow my curiosity about where things are located wherever I travel and later add that data to OSM. It might be Places of Interest (POIs), like fuel stations, restaurants, bars, schools and temples, or street names, route numbers, campgrounds or picnic tables, Those surveys might take place in Thailand or Alaska or anywhere else I happen to be. It's all grist for the mill and worthy of addition to the Open Street Map of the world. I've added data for Thailand, of course, but also Fiji, Iceland, Turkey, Austria, New Zealand and Laos, Cambodia and Eugene, Oregon, Africa, North Carolina, Buffalo, NY, and the Adirondack Mountains of that same state. But my main focus for the past couple of years has been adding geographical features in Alaska. I can do this from my office here in Thailand because OSM offers fantastic computer mapping resources over the Internet. I can access a fine selection of high-resolution satellite imagery that covers most of the planet. And in the U.S., we have available the excellent USGS Topographic maps, the ones I used to collect and revere years ago, that can be overlaid on top of the satellite imagery to help position, outline and attach officially recognized names to the features I'm adding. When I first got involved with the project, most of Alaska's roads were already present in the OSM database but almost none of its rivers, lakes, glaciers, wildlife refuges, or campgrounds. The highway data that was present was often fairly inaccurate because it was based on poor but copyright-free U.S. government TIGER™ data. There are very few OSM volunteers that live and map in Alaska so improvements to that poor highway data happen only slowly. Luckily, as a retired person, time is something I have plenty of. Although it would be virtually impossible for one person to completely map Alaska's vast area, I took it as a personal challenge to work towards achieving both those goals. 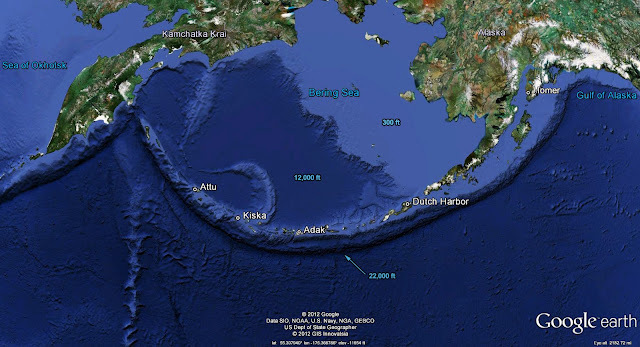 Check out the OSM map of Homer, Alaska, my hometown, to see the result of a very small part of what I've been doing. The map is zoomable (with +/- keys) and can be panned by left-clicking and dragging with your mouse. Sometime last year I happened upon a blog post about the Iditarod, Alaska's iconic dog sled race, written by a fellow named Aiden Harding. Harding had traversed the entire Iditarod Trail in cold winter on a fat-tire bicycle — a truly amazing feat. In his blog, he mentioned that he had recorded GPS traces of the journey. I dropped him a note asking if I could use his traces to help sketch in the Iditarod where it passes through otherwise unmarked, roadless territory. He responded enthusiastically and provided the traces. Then during the next week or so I added the trail to OSM. Is the data I uploaded positioned perfectly? No, but that doesn't really matter so much considering that the actual route changes from year to year depending on snow and weather conditions anyway. My goal was to add it to OSM so anyone with a desire to see where the trail traverses Rainy Pass or where it passes the Carlson Crossing Safety Cabin can do so. My workflow while mapping the Iditarod involved adding sections of trail using Aiden's traces as a guide and adding details derived from the USGS Topos in the areas adjacent to it. Using OSM's editor JOSM, I was able to "see" the trail from my office computer on Digital Globe's high-quality satellite imagery in places where it was also being used in the summer and therefore visible, and with the help of Harding's GPS traces position it in places where it wasn't visible due to trees or cloud cover. I added river crossings and other features that I dug up on the Internet, things like rescue cabins and checkpoints, and added names to nearby streams and rivers based on the USGS Topo maps that can be overlaid above the satellite imagery in JOSM. 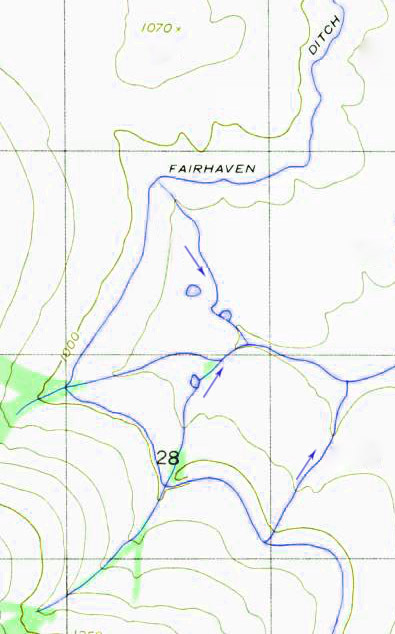 Anyway, as the Iditarod got close to Nome I began noticing some strange features on the topo maps. There were these thin blue colored lines drawn exactly as a stream would appear on such maps, but rather than flowing downhill as would a normal stream or river, they followed the contours (lines of equal elevation) of the hills and valleys they traversed. How strange — what are these things? I wondered. A closer exploration of the USGS Topographic Maps eventually turned up a name for one of these "streams", Fairhaven Ditch (Wikipedia), and that led me to ferret out some interesting facts about Alaska's gold mining past. The photo below is oriented with North at top and represents an area of about 2.7 by 1.5 miles. 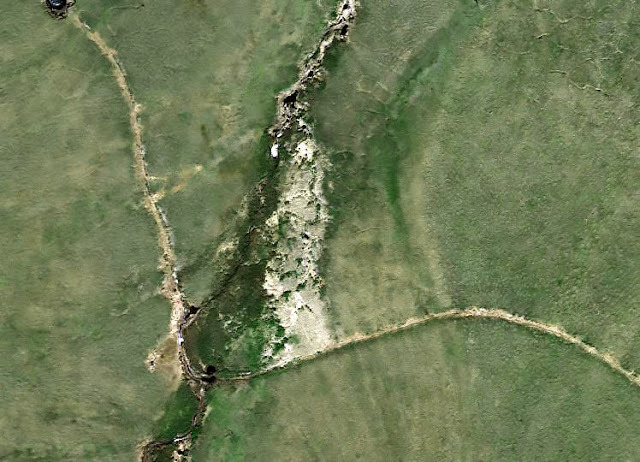 In the satellite photo above you can see the remnants of the ditch from fairly close-up. There is no water flowing these days but you can easily discern the canal path. In this section, the canal is skirting the valley of the small unnamed stream flowing north just as many roads follow the contours of valleys in the same way. When most people, including myself, think of Alaska we imagine a huge, wild, and unspoiled wilderness, which it is relative to most other places on the planet. 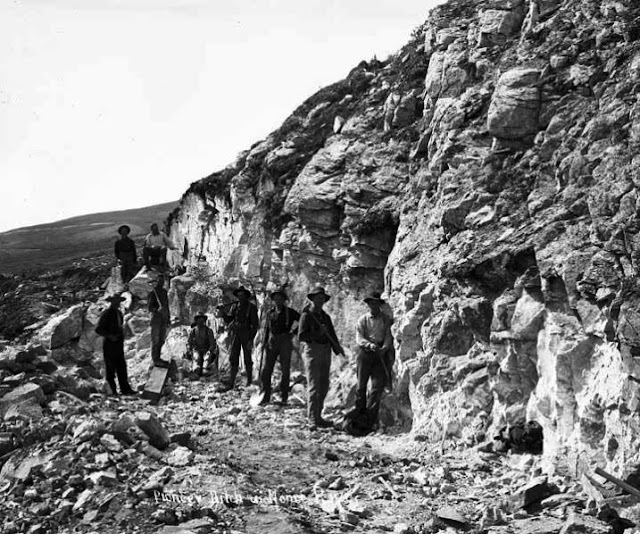 However, the hand of man is evident almost everywhere — Alaska's been completly explored and in many places literally ripped apart by people searching for riches like gold, metal ores and lately, oil. These ditches, actually canals, were built back around the turn of the last century to carry water from high mountain streams down to where miners were working the streambeds in search of gold. By "working the streambeds" I mean using the high-pressure water delivered by these canals to blast away overburden and move the now exposed gravels to huge sluice boxes where the gold was separated from the gravel in a process known as placer mining. In those days, there was no conservation ethic or EPA to prevent people from doing whatever it took to get at that gold. Wilderness was the enemy. Overburden, the sand and soil that covered the gold-bearing gravels, was simply blasted away and allowed to run downstream where it suffocated fish and fouled everything mightily. Even the term used, overburden, suggests to me disrespect for the environment. Much of this overburden was deposited during the Pleistoscene (between about 12,000 years and 1.8 million years ago) and contains the remains of extinct species such as mammoth and steppe bison. Oh, well. That was then and this is now. Unfortunately, our habits around gold and other valuable minerals haven't changed all that much. There is still a push for rapacious development of mines and oilfields in Alaska, a state that has no income tax and provides a huge yearly dividend to every Alaskan man, woman and child. Alaska can do that because it derives almost all of its revenue from resource extraction in the form of oil. The Alaska state government has always been notoriously pro-development and it remains so to this day. The recent anouncement by the Trump administration that it would seek to open the Alaska National Wildlife Refuge (ANWR) to oil exploration came as a blow to many Alaskans but the move was advanced and applauded by the entire Alaska Congresssional delegation, good Republicans that they are. wide on either side of the ditch. This should be done, if possible, the summer before actual construction is begun, in order that the ground may thaw more readily. Actual construction begins with plowing, after which some of the material is moved with a grader from the upper side of the ditch to the lower bank until a practically flat bench is produced. The cut is then excavated with horse scrapers down to grade, and the material piled up on the lower bank. The ditch is finished by hand, and both bottom and bank are trimmed to an even grade and alignment." "The sod is cut with mattocks into pieces 1 to 2 feet square and placed in the ditch, bottom up. Two layers are usually placed in the bottom, breaking joints as well as possible, and the whole is carefully and solidly tamped into place. The sides of the ditch are made tight with a sod wall, the pieces being laid one above another, bottom up. Where the sod is above the water line part of the time, the grass usually continues to grow and its living roots bind the material more closely and firmly together." Below are a couple of photos, (ca. 1901) of the Miocene Ditch on the Seward Peninsula. One of the first ditches constructed, it was 31 miles in length. Its feeder streams added another 31 miles to the total project. Pictured is a section that was cut through a rock outcropping known as "Cape Horn". Building the Miocene Ditch at "Cape Horn"
Sometimes it wasn't practical, either because it was too expensive or simply too great a distance, to run these ditches far enough upstream to cross on grade as you see on the topo illustration above. The clever mining engineers built gigantic siphons (more correctly, inverted siphons) to move water across many a creek or valley. The first large siphon built, that of the Miocene ditch across Manila Creek, is about 1,000 feet in length and is composed of 40-inch steel pipe with joints riveted throughout. Water from a ditch enters the "top" of these siphons, flows downhill inside the pipe, and emerges at the downstream side to continue its journey to the goldfields. As long as the exit is slightly lower in altitude than the entrance, water will flow. I came across a remnant of a siphon on the Davidson Ditch (Wikipedia) that runs along the entire length of the Chatanika River. The Davidson Ditch is 90 miles long and crosses many valleys, some fairly large, on its journey to Fairbanks. 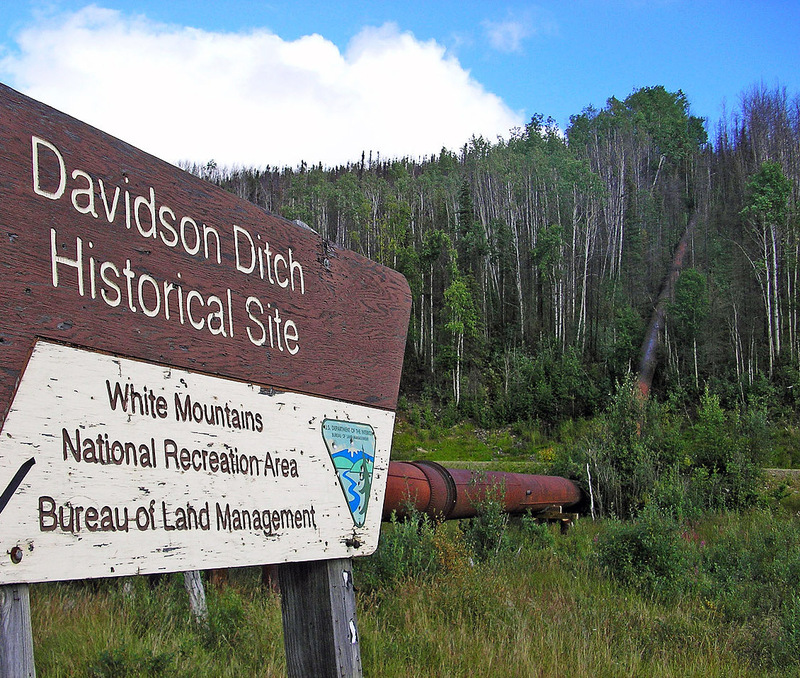 I spent a rainy night camped in my RV in the pulloff at the Davidson Ditch Historical Site on the Steese. 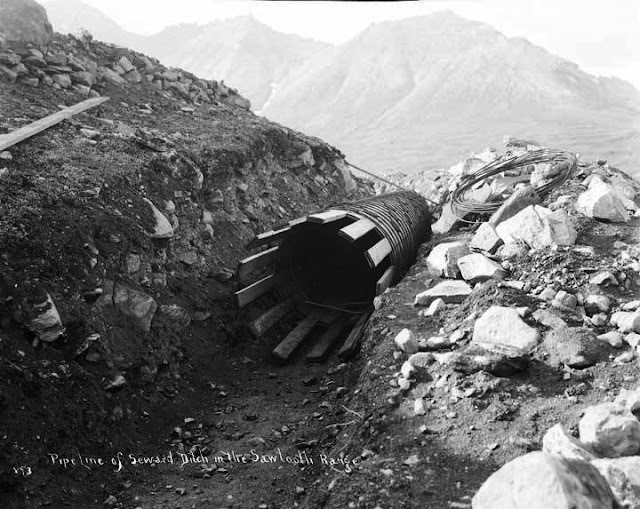 This photo shows the massive pipe used to carry the water across the valley of the U.S. Creek. Credit goes to Wikipedian JKBrooks85 who released his photo to the public domain. If moving steel pipe into the wilderness proved too expensive or otherwise impractical, the siphons were built on-site using wood staves wrapped with steel strengthening bands much like a wooden barrel is made. During my reading I was continually amazed to learn how much effort was made, how much ingenuity was brought to bear, in overcoming the problems of mining in such a remote and inhospitable region. 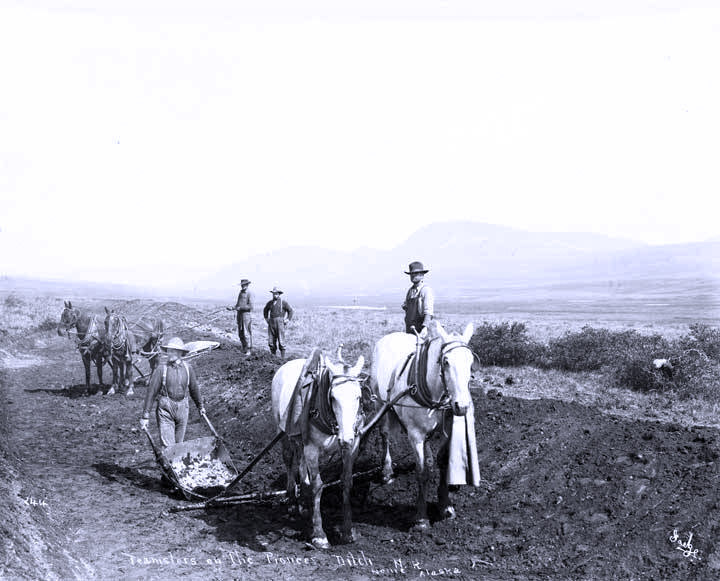 In some cases hundreds of horses and hundreds of men were put to work for several summers in these mammoth-for-the-time construction projects. As soon as the ground froze, usually sometime in September, work would be suspended until the following spring. As I pan around as a virtual explorer examining high quality satellite imagery in backcountry Alaska, I can see remnants of these old placer mines and the many roads that serviced them almost everywhere. These scars on the landscape will be visible for decades or centuries hence. 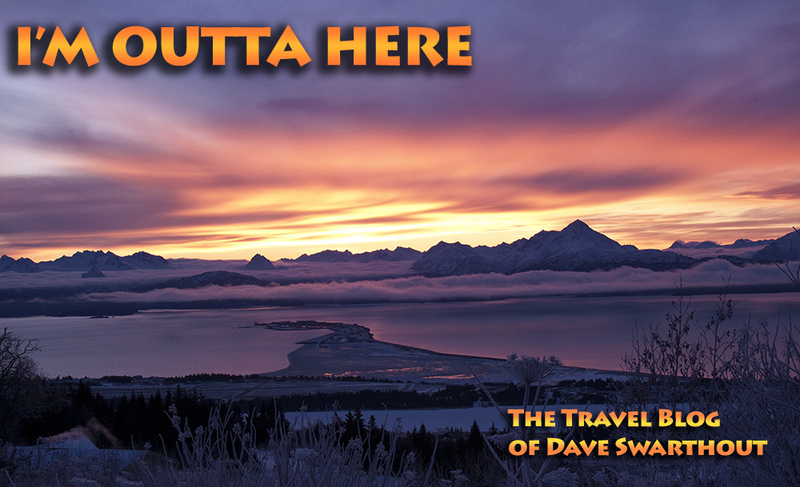 I hope you enjoyed this jaunt through Alaska's goldmining past. Living in a remote camp has many challenges not the least of which is, where do I put my gold after I take it out of the ground? I came across a note somewhere that said miners used to send gold ingots to the U.S. Mint via Registered Mail. This sort of thing continued to happen in Alaska not so long ago. A good friend told me stories of his days setnet fishing in Bristol Bay back in the 1980s. Because there were no banks nearby they used to buy USPS money orders with the cash they received from selling their fish. The money orders were a lot safer than cash and much easier to hide. Click on the link for a full copy of the Surface Water Supply of Seward Peninsula paper referenced above (PDF). I found much of it interesting reading.